Leaving the Escapee's Dream Catcher Park in Deming I headed west with Quartzite as my ultimate destination but being in no hurry I cut the drive in half and stayed a night at Casino Arizona in Scottsdale. The casino is located on the Salt River Pima-Maricopa Indian Reservation and is run and operated by the Community. The somewhat modernistic Casino Arizona. 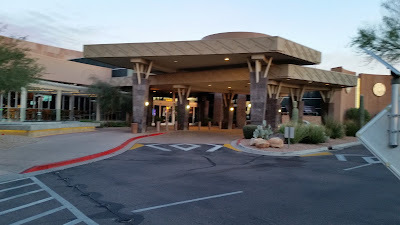 Unlike most casinos I've stayed at where they just wave you over to the far side of the parking lot Casino Arizona has you check in at the security desk, secure a Players Card, then fill out a one page detailed information sheet before they let you stay overnight. I did all this and played some craps which I won money at, then watched the exciting College Football Championship on their sports bar's gigantic screen. Beer was consumed and a splendid time was had! The next morning I was somewhat tempted to stay another day (they let you stay for three nights) but I decided to quit while I was "ahead" and did a workout and shower at one of the many Anytime Fitness gyms in the Phoenix area then jumped back on I-10 for Quartzite and the Desert.